Ochira Parabrahma Temple is one of the famous sacred places in Kerala India.The temple is located at Ochira on the side of NH47 in Karunagappally Taluka ,Kollam district of Kerala India. Ochira is situated 8 km away from Karunagappally. Also known as Dakshina Kashi , Oachira Temple is a unique pilgrim centre, situated on the way to Alappuzha.Here is some fact about Ochira Parabrahma Temple in Kollam district of Kerala India. Temple Architecture : Kerala Architecture style of layout.There is no sanctorum in the temple. How to Reach by Air: The Nearest Airport is Trivandrum Airport(100 km) & Cochin Airport(140 km). How to Reach by Rail :The Nearest Railway station is Kayamkulam (5 km) & Karunagappally(12km). How to Reach by Road:There are many public and private vehicals available to reach here.Kayamkulam Bus station is 5 km north of ochira and Karunagappally Bus Station is 10 km south of ochira.The ferry station is adjacent to the central bus station that is 3kms from Kollam the railway station. Ochira Parabrahma Temple known as Dakshina Kaashi in Kollam district of Kerala India.The uniqueness of this temple is there is no idol in this temple.A striking feature of this temple is that like the traditional temples which have definitive structural layout and mode of worship, the temple at Ochira does not have a proper structure or an idol for the visitors to worship.Dedicated to Parabrahamam attracts a large number of pilgrims, particularly during the festival called Oachirakkali in June-July. 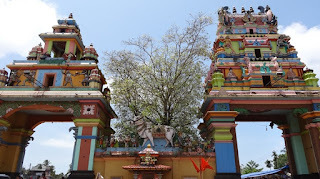 The Panthranduvilakku Mahotsavam (November-December) of this temple is also very famous. Ochira is situated 8 km away from Karunagappally. There is no temple in the real sense. 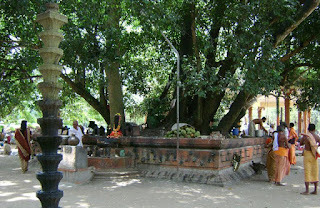 Around big trees in vast open area there are exposed small idols.oachira temple Some idols are of female forces attributed to Shakti (power) and the others are of Parabrahmam, the omnipresent. To the right of the idols surrounded trees is an Ayyappa swamy kshetram (temple) constructed similar to Sabarimala temple, and to the left is a mosque. There are many Story and beliefs how this place get name Ochira. some human being believed that the place name came from the word Omkarachira Some believed that the name is originated from the name Oymanchira. According to mythology the name come from strong believed the name derived from Uvachanchira as Uvachan means Lord Siva.Param Brahmam is the mythical God of Ochira temple and obviously the name of the place is interpreted by the spiritual people based on the extreme power.The interpretation : ‘Om’ is the representation of Parambrahmam the god of all gods. The word ‘Chira’ means piece of land. These two words combined together ‘Om Chira’ meant the ‘land of Param brahmam’. Om chira became Ochira during the course of time. The Truth cause of this name is that there was a large reservoir at the center of the large ground called Padanilam.This chira was used by the soldiers in olden days for bathing and for supplying water to the horses used in the war exercises.chira might have been known in olden days as Onattuchira, as the place belonged to the Kayamkulam Raja who was also called the Odanattu Raja or simply Onattu Rajah.hence it is believed that the word Onattuchira was gradually accepted as the place name and as time passed by further, that word was corrupted into Oachira. 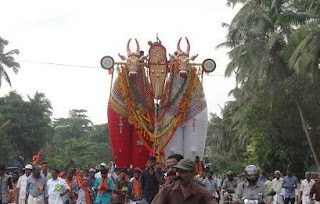 Ochira Kalii festival held in mid-June , Panthrandu Vilakku or twelve lamps festival, held in November-December and Irupathettam Onam are the famous festivals celebrated here. 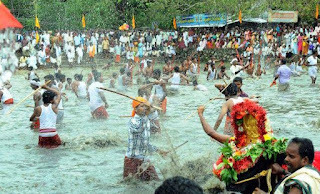 The Oachira Kali (game) on the first and second of Mithunam (mid-June) is a big draw. 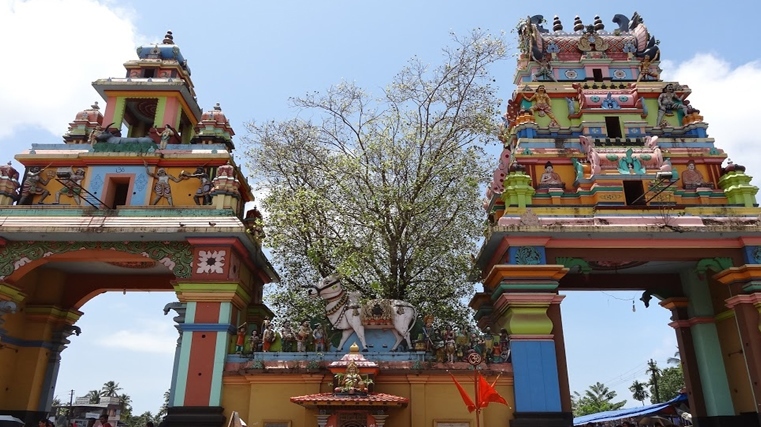 For the last 60 years, the temple administration manages a social organisation named 'Annadana Mandhiram' and this organisation serves daily free lunch for about 500 people. The main festival at the temple is a 12-day affair, called 'panthrantu villaku'(twelve lamps) starting on the first day of Vrischikam (Malayalam era) falling in the middle of November. The Ochira Kali (game) on the first and second of Mithunam (mid-June) is a big draw. The 'game' as it were imitates a battle of rival armies and is held more often in knee-deep rainwater at the peak of the monsoons, and the belief is that it will invariably rain on Ochira Kali even in a drought year.